Universe Holomatrix gives your text, footage, HUD elements and logos the look and distortion of a sci-fi hologram digital display, and more. A major upgrade from the original Effects Suite Holomatrix, this version is built for speed and is full of new features. Drag the uni.Holomatrix II effect onto your clip. Click the Choose a Preset button to see an animated preview of all the presets available. Double-click any preset to apply. More Damage adds more distortion to the effect, splits the color changes, adds noise and static, and breaks apart the image. The damage will appear in different forms depending on what preset you have selected. Some have more static effects, while others more separation of color. More Often increases how frequently the glitches and damage appear in the frame. Punch It: Holomatrix II uses a % chance to decide how often any random effect should occur. This means you can get effects like glitching, color separation, etc at random. But sometimes you want to control when the effects to appear (ex: timing with audio). When this checkbox is turned on, it will activate any effect that is checked on by setting it's % chance of occurring to 100%. So while a given effect may have only a 25% chance of occurring normally, when Punch It is turned on, that effect will have a 100% chance of appearing. Effect Scale changes the size of the effect. Useful when working with compositions that are smaller (SD) or larger (4K) than the standard HD 1080 size. Scale the effect up or down over the image to get the correct look for your composition. UnMult makes the alpha channel of the Holomatrix layer transparent when the box is checked, allowing you to composite the hologram or ghost over background footage more easily. Alpha Edge Fix removes a color fringing effect that sometimes occurs on the edges of an image in Holomatrix when the image has a partially transparent alpha channel (such as keyed footage or text). Checking the box will remove the fringing. However, you would not want this turned on with straight video that has a fully opaque alpha channel. Frame Rate: The default Frame Rate setting is 10 FPS, which gives the hologram or display a jerky, distorted feel throughout the effect. If you’d like a smoother animated effect, set this value to match the footage’s original frame rate. Note: Frame Rate also affects the frame rate of the various Holomatrix effects in exactly the same way. For example, the motion of the horizontal Lines in some of the presets is affected by Frame Rate. The speed of the line motion is not affected; only the playback rate of the effect is changed. Disable Time FX: You may notice that if you apply Holomatrix after other effects have been applied to your footage, those effects will disappear. This happens because Holomatrix includes many effects that distort the flow of a footage’s time (effects like Frame Rate, Random Frame Rate and Freeze Frame), which have to bypass previous effects. Usually, you can just pre-compose a layer with the effects applied, and then apply Holomatrix onto the precomp. However, Disable Time Effects, shuts off all of Holomatrix’s time-based effects while keeping the other Holomatrix effects live - and allows previous effects in the stack order to also remain live. Important: When Disable Time Effects is turned on, other Holomatrix effects like Lines and Static will still play back based on whatever frame rate you have set for Holomatrix’s Frame Rate. So while your 24P footage would play back at 24FPS, if Frame rate is set to 10 FPS, the Holomatrix effects will continue to play back at 10 FPS. Random Seed: This is used to give results with different random values. If you don't like the result of the effect on a given frame, change this value and it will re-calculate any of the random values used to create it. This slider is also helpful if you have more than one layer being effected and you don't want them to look exactly the same. Blend with Original combines your Holomatrix effects with your original footage. If you’d like to keyframe a graceful transition, begin with Blend with Original control at 100%, exposing the original image completely and animate it to 0% to show just the Holomatrix effect. In the Effects group you will find a list of checkboxes that let you activate or deactivate an associated group of controls. You will notice that not all checkboxes are checked “On’ at all times. Changing presets in the Preset menu will turn some of the boxes on or off, depending on which effects are needed to create the preset. To add an effect to the current preset, simply check one of the boxes “on” and twirl down the menu arrow next to the name of group. There you’ll find the sliders for each advanced control that you may adjust or keyframe to get the desired look. % Chance of Random Frame Rate: Determines the chance of a random frame rate occurring. Default setting is 10%. Value range is 0 to 100, measured in percentage. Higher values increase the chance of a random rate. Frame Rate Randomness Range (%) Determines how much the random frame rate can vary from the set Frame Rate value. Default setting is 20%. Value range is 0 to 100, measured in percentage. Higher values increase the amount of variance in frame rate. Frame Rate Random Duration Determines how long a random frame rate can last. Value range is 0 to 200, measured in seconds. Higher values increase the length of the random rate. Random Duration Variation Determines how much the random frame rate duration can vary. Default setting is 10%. Value range is 0 to 100, measured in percentage. Higher values increase the chance of a random duration. Technical Note for Frame Rate. The Frame Rate parameter controls the frame rate of the original footage and the effects. However, if your imported footage and the composition have different frame rates, then using Frame Rate gets complicated because you are dealing with three frame rates: the footage frame rate, the composition frame rate, and the Holomatrix frame rate. Technically, Frame Rate is not altering the footage frame rate. It is altering the composition frame rate. This is because when you apply Holomatrix to a layer, in order to run properly, Holomatrix pre-composes the footage at the same frame rate as the original comp. If your footage is 25 FPS but the comp is 30 FPS, then Frame Rate is playing with the 30 FPS settings of the comp (and pre-comp), not the footage's 25 FPS settings. Normally in After Effects, if your footage runs at 15 FPS, but your comp runs at 30 FPS, then every frame of your footage is played back twice to fill in the gaps between frames. If you use Holomatrix's Frame Rate controls, and set the Frame Rate to 10 FPS, then you are making that 30 FPS comp behave like a 10 FPS comp. That means 2 out of every 3 frames is dropped. Normally when your footage is 30 FPS, and your comp is 10 FPS, this means the comp is dropping every 2nd and 3rd frame. This will make the footage play evenly. However, this means that your 15 FPS footage will first double every frame (to fill the 30 FPS comp), and then drops every 2nd and 3rd frame (as 2/3rds of the comps frames are discarded). So some frames will be doubled while others will be dropped, depending on where they fall in the timeline. Working with 3 frame rates is not ideal unless you are trying to simulate bad reception, because you are alternating between repeated frames and dropped ones. Bottom line is that we recommend setting your imported Holomatrix footage to the same frame rate as the Holomatrix composition! That way, you are only dealing with two frame rates: the footage frame rate and the Frame Rate parameter. The Colorization checkbox uses the three color swatches in the Color/Brightness settings group. When Use Colorization is turned off, the original colors of the footage are used. The Color/Brightness Settings options let you change the brightness, contrast, color and blend of the color palette. Source Brightness controls the brightness of the original footage. Default setting is 0. Value range is -100 to 100. Higher values increase the brightness level. Source Contrast controls the contrast of the original footage. Default setting is 0. Value range is -100 to 100. Color – Highlights, Midtones, Shadows set the highlight color, midtone color and shadow color for the footage. Default settings are shown below left: Highlights at light blue, Midtones at medium blue, Shadows at black. Colorize % determines how much of the layer is colorized. Default setting is 100%. Value range is 0 to 100, measured in percentage. Higher values add in the colorization effect. At 100%, the color effect is fully applied. At 0%, the color effect is essentially turned off. Glow Threshold determines how much of the original image is included in the glow, based on the brightness values of the source image. The brighter the pixels, the more the glow applies. Default setting is 92. Value range is 0 to 100. Higher values raise the threshold, which makes the glow less intense. Glow Radius determines how far the glow extends. This distance is measured in pixels from the bright areas of the image. Default setting is 10. Value range is 0 to 100. Higher values produce more diffuse glows. Lower values produce glows with sharp edges. Glow Intensity determines the brightness of the glow. Default setting is 1. Value range is 0 to 100. Higher values increase the intensity of the glow. Secondary Glow Radius controls the growth of a blurry glow. This glow typically shows along the outer edges of the source image. Default setting is 16. Value range is 0 to 127. Higher values increase the spread and diffuseness of the glow. Lower values make the glow tighter and more intense. Scan Line Distance determines how far apart the scan lines are set. Default setting is 3. Value range is 0 to 200. At 0, there are no lines and the image is solid. Higher values increase the distance between lines, which creates visual gaps in the source footage. Scan Line Thickness controls the thickness of the scan lines. Default setting is 4. Value range is 0 to 200. Higher values make the lines thicker. If the Scan Line Distance is low, the thickness of the lines may overtake the gap between lines, making the source image appear solid again. Scan Line Feather controls the softness of the scan lines. Default setting is 2. Value range is 0 to 200. The default value of 2 gives the lines a hard edge. Higher values make the lines softer, giving them a feathered edge. This softness is often difficult to see unless the Distance and Thickness values are high. Scan Lines Direction lets you choose between Horizontal, Vertical or a combination of Horizontal & Vertical scan lines going in both directions (such as for a dot matrix look). Scan Line Fix forces Holomatrix to use integers only in calculating scanlines. This ensures that scanlines are always spaced apart perfectly. Disable Scaling: With this turned on, Holomatrix will ignore auto-scaling and use the absolute values the user sets in the scanline parameters, not the auto-scaled equivalent - allowing users to create thinner scanlines. LU - Speed controls the speed of the Lines Up moving through the frame. LU - Line Height controls the Lines Up height as they move through frame. At low values, the lines are thin like 'regular' lines. Higher values make the lines thicker, or wider in height. At very high values, the lines get thick enough that you will only marginally see them as they move upwards, which creates a more subtle effect. LD - Speed controls the speed of the Lines Down moving through the frame. LD - Line Height controls the Lines Down height as they move through frame. At low values, the lines are thin like 'regular' lines. Higher values make the lines thicker, or wider in height. At very high values, the lines get thick enough that you will only marginally see them as they move upwards, which creates a more subtle effect. LU/LD - Random Seed randomly changes the appearance (like brightness and position) of the lines. Default setting is 0. Value range is 0 to 100. Changing the value selects a different random seed. LU/LD - Opacity Min sets the minimum opacity for the lines during strobe. Default setting is 15%. Value range is -100 to 100, measured in percentage. Higher values give a greater opacity to the lines. Lower values make the lines more transparent. LU/LD - Opacity Max sets the maximum opacity for the lines during strobe. Default setting is 30%. Value range is 0 to 100, measured in percentage. Higher values give a greater opacity to the lines. Lower values make the lines more transparent. Opacity Min and Max work together. Min sets how transparent the lines can be, while Max sets how opaque (or solid) they can appear. LU/LD - Strobe Every X Frames sets how often the lines strobe. Default setting is 0. Value range is 1 to 100, measured in frames. Higher values make the strobe happen less frequently. LU – Fade Instead of Strobe Determines if the lines fade or strobe between Min and Max opacity values. This checkbox is turned off (unchecked) by default. When the checkbox is off, the lines do a 'strobe'. This means their opacity jumps between the Min and Max values over time, determined by the parameter Strobe Every X Frames. When the checkbox is on, the lines do a 'fade'. This means they interpolate between values, becoming more or less visible over time. The longer your strobe time, the more you will see the difference between a strobe and a fade. If your strobe time is only a few frames, the fade up and down will happen quite quickly, almost looking like a strobe light effect, especially if you are using a low frame rate. Lines Distortion Strength uses the lines in the effect as a displacement map and pushes pixels on the X-axis. Darker lines push in one direction and lighter lines in the opposite direction. Higher values yield more displacement. Scrolling Line creates the effect of a horizontal line scrolling down the screen, displacing the footage. With the right settings it can also be used to generate a randomly placed white line that jumps around the footage. Scrolling Line On/Off Checkbox: Activates the Scrolling Line effect. SL - % Chance Determines how likely a given block of time will have a Scrolling Line. SL - Duration Determines the length of time for a Scrolling Line. SL - Duration Variation Determines how much a block of Scrolling Line time can vary in length. Higher amounts mean more variation from the set duration. SL - Line Speed Determines how fast the line will scroll down the screen. Negative numbers make the line travel up the screen, instead of down. SL - Line Height Determines the height of the scrolling line. SL - Distortion Strength Determines how much the footage will be distorted horizontally. Higher values = more distortion. SL - Fade TimeDetermines how much time will be used to fade the line and it’s distortion on and off at the beginning and end of the effect occurrence, or as it reaches the top or bottom edge. With a low number, the line will appear to pop onto the screen. With a higher number, it will fade in smoothly over time. SL - Offscreen Edge % Determines how far from the edge the fade begins. SL - Random Start Position Allows the scrolling line to start from a random position so that the effect seems more organic - rather than it starting from the very top each time, and looking repetitive. SL - Randomize Position When turned on, the scrolling line will jump position horizontally, while continuing to scroll up or down. How often it jump position is based on the next parameter: SL - Randomize Position Frequency. SL - Randomize Position Frequency This determines how often the scrolling line will jump horizontally each second. A value of 30, means that it will jump position 30 times a second. SL - Random Seed Randomized the various properties in the Scrolling Line effect. Static Settings create, you guessed it, static. Basically, 'static' is a lot of a little noise. The static is subtle and you can make it more or less so. Static Size determines the size of the static. Default setting is 12. Value range is 0 to 100. Higher values make the static grain larger. NOTE: Static can best be seen if Color Contrast is set low in the Color/Brightness Settings group. Static Opacity determines the opacity of the static. Default setting is 20%. Value range is 0 to 100, measured in percentage. Higher values make the static more opaque (or solid). Lower values make the static more transparent. Noise Opacity determines the opacity of the color noise. Default setting is 75. Value range is 0 to 100. Higher values increase the visiblity of the noise. NOTE: Color Noise is fully visible if the Use Colorization checkbox is turned off. With Use Colorization on, the prismic color of the noise will not be preserved, though some amount of noise will still be seen. Noise Scale allows you to scale the color noise. You cannot scale below 100%, which is the default setting. Value range is 100 to 1,000%. Higher values increase the size of the noise. % Chance of Interference: In this group, the main parameter is % Chance of Interference. This controls determines how likely we are to see the interference ghost at any given frame. Default setting is 25%. Value range is 0 to 100, and measured in percentage. Higher values mean the ghosting is more likely to happen. Advanced Parameters: How Random Positioning Works The Interference Ghost group has a group of Random Position parameters. Let's talk a little about how they work. Chance of Random X and Y affect how likely the interference ghost is going to happen. The parameters do this by setting a random value to the likeliness. Random X and Y Min and Max determine how far, measured in pixels, the ghosting can occur from the source image. For instance, if the Random X Max value is 100, then the ghost can’t be more than 100 pixels away from the source image horizontally. If the Random X Max value is 1,000, then the ghost can’t be more than 1,000 pixels away from the source image horizontally. With X Min/Max at 100/1,000, the ghosting is a value that is randomly chosen between 100 and 1,000 pixels distance from the source. Now let's look at the details of the Position controls. Chance of Random X Position Determines how likely the ghost will be offset on the X axis. Default setting is 0%. Value range is 0 to 100 and measured in percentage. Higher values mean the X axis ghosting is more likely to happen. If Random X Position is at 0, then Random X Min and Random X Max will have no effect on the ghosting. The ghost will not have horizontal movement. Random X Position Min Determines the minimum possible offset value, in pixels, for the Random X Position. Random X Min moves the ghost along the X axis, to the left and right of the source image. Default setting is -200. Value range is -2,000 to 2,000. Higher values move the ghost to the right. Lower values move the ghost to the left. Random X Position Max Determines the maximum possible offset value, in pixels, for the Random X Position. Random X Max moves the ghost along the X axis, to the left and right of the source image. Default setting is 200. Value range is -2,000 to 2,000. Higher values move the ghost to the right. Lower values move the ghost to the left. Chance of Random Y Position Determines how likely the Interference Ghost will be offset on the Y axis. Default setting is 15%. Value range is 0 to 100 and measured in percentage. Higher values mean the Y axis ghosting is more likely to happen. If Random Y Position is at 0, then Random Y Min and Random Y Max will have no effect on the ghosting. The ghost will not have vertical movement. Random Y Position Min Determines the minimum possible offset value, in pixels, for the Random Y Position. Random Y Min moves the ghost along the Y axis, up and down from the source image. Default setting is -200. Value range is -2,000 to 2,000. Higher/positive values move the ghost downwards. Lower/negative values move the ghost upwards. Random Y Position Max Determines the maximum possible offset value, in pixels, for the Random Y Position. Random Y Max moves the ghost along the Y axis, up and down from the source image. Default setting is 200. Value range is -2,000 to 2,000. Higher/positive values move the ghost downwards. Lower/negative values move the ghost upwards. Set value to 0: Random Y Max is an important parameter because it can save your project from looking fake. (Since we all know holograms are real!) If Random Y Max is set to 0, then the ghosted image can't go lower then the bottom of the source image. This keeps the hologram image from appearing to move lower than the floor line. How Distortion Works The Interference Ghost group also has a group of Distortion parameters. (This is a very busy group.) Let's talk a little about how they work. The Distortion parameters give the interference ghost a chance of being distorted by making the ghost look wavy. Distortion is activated by the Use Distortion checkbox. Of course, Use Interference Ghost also needs to be checkmarked, since Distortion is distorting the ghost rather than the source image. Let's look at how Distortion works. % Chance of Distortion Determines how likely we are to see the distortion at any given frame. Default setting is 10%. Value range is 0 to 100, and measured in percentage. Higher values create a greater likeliness of distortion. Distortion Min Determines the minimum waviness of the ghosted distortion. Default setting is -6. Value range is -100 to 100. Positive values make the distortion move in one direction. Negative values move the distortion in the opposite direction. At 0, there is no visible distortion. At -100 and 100, there is the highest possible distortion. Distortion Max Determines the maximum waviness of the ghosted distortion. Default setting is -3. Value range is -100 to 100. Positive values make the distortion move in one direction. Negative values move the distortion in the opposite direction. At 0, there is no visible distortion. At -100 and 100, there is the highest possible distortion. How Min and Max work together Distortion Min and Distortion Max work together by setting the potential amount of distortion. The higher each of these values, the more likely there will be a waviness, and the more distorted that waviness will be. For example, if Distortion is set to Min -5 and Max 5, then there is a small range of distortion and the possibility that Distortion will hit 0, meaning no visible distortion. If Min is -50 and Max is 50, then the range of distortion possibilities is greater. Distortion Duration Determines how long a given distortion will take place. Default setting is 0.3 (which is 30% of 1 second). Value range is 0 to 5, measured in seconds. Higher values mean the amount of time is longer. Distortion Duration Variation Determines how much the length of time for a given distortion can vary from the Distortion Duration value. Default setting is 25%. Value range is 0 to 100, and measured in percentage. At 0% Variation, there is no variation. Higher values mean the variation will be greater. At 100% Variation, the Distortion Duration can as much as double the set amount of time. It can also show no distortion, as the range to set Distortion Duration is now between 0-100%. Color Separation simulates a Red/Green/Blue separation of the image, similar to what you would see in a bad TV transmission. Among other features, you can choose the amount of separation and how often the colors will separate. In this group, the main parameters are % Chance of Color Separation, a choice of Colors, and Amount of Separation. All other parameters are placed in an Advanced section for the power user. You can play around with the separation effect quite a bit, so let's look at how. % Chance of Color Separation determines how likely the colors are to separate at any given frame. Default setting is 25%. Value range is 0 to 100 and measured in percentage. Higher values mean the separation is more likely to happen. Amount of Separation determines the distance between the separated colors. Default setting is 7. Value range is -100 to 100 and measured in pixels. High positive values (like 80) and low negative values (like -80) move the colors further from their source image. Positive values move the Red to the left, and the Blue or Green to the right; negative values do the opposite. A value of 0 does not separate the colors, but they still appear over the image, altering its colors slightly. Low-Res settings simulate incomplete data coming in through the holographic data stream. The Low-Res group is enabled by the Low-Resolution checkbox. This makes the Holomatrix image look pixelated and chunky, as if there isn't enough data coming through. Low-Res % sets the resolution for the video, making an effect that is pixelated and chunky. Default setting is 25%. Value range is 0 to 100, measured in percentage. Higher values show more pixels, which makes the footage sharper. Lower values show less pixels, which makes the footage more pixlated. A setting of 25% shows a quarter of all pixels in the footage; i.e., every 4th pixel. At 100%, all pixels are showing and the image does not look pixelated. The Random Low-Res group (which happens to be our favorite!) is enabled by the Random Low-Res checkbox. This parameter randomly generates low resolution frames to simulate that incoming/outgoing bad signal. When Random Low Res is enabled, the Holomatrix effect will randomly lose resolution at times. Random Lo-Res Min sets the minimum possible resolution value. This is the lowest the resolution will go during the occurrence of a Random Lo-Res frame. Default setting is 12.5. Value range is 0 to 100. Higher values set a higher minimum resolution. Random Lo-Res Max sets the maximum possible resolution value. This is the highest the resolution will go during the occurrence of a Random Lo-Res frame. Default setting is 25. Value range is 0 to 100. Higher values set a higher maximum resolution. How Low-Res % works with Min/Max Let's talk about how Random Low-Res Min and Max work together. A great example is if we set Min to 12.5% and Max to 25%. When the Random Low-Res effect appears, it will have a resolution between 12.5% and 25% of the original footage. Min and Max are also affected by the Low-Res Settings> Low-Res %. No matter what your Random Low-Res Max value is set to, the effect will never generate a resolution higher than the Low-Res %. Let's say your Low-Res value is set to 17%. Even if your Random Low-Res Max is set to 25% (higher than the Low Res value), the effect will still only have a maximum output of 17% resolution. Random Low-Res Settings> % Chance of Low-Res Determines how likely a given block of time will have a Low-Resolution appearance. (That block of time is set by the Low-Res Duration parameter.) Default setting is 10%. Value range is 0 to 100, measured in percentage. Higher values mean the low resolution appearance will be more likely to occur. Low-Res Duration Determines the length of time for random blocks of Low-Resolution. Default setting is 0.3. Value range is 0 to 5, measured in seconds. Higher values mean the amount of time is longer. Low-Res Duration Variation Determines how much a Low-Resolution block of time can vary in length. Default setting is 25%. Value range is 0 to 100. Higher values make a greater variation in length of time. Freeze Frame decides when, how often and how long the holographic signal will freeze. This decision is somewhat random and creates the effect of a signal loss. NOTE: A frozen frame in an animation is difficult to show in a still image manual, so there are no sample images to accompany the descriptions on this page. % Chance of Freeze Frame Determines possibility of a random Freeze Frame. Default setting is 10%. Value range is 0 to 100, measured in percentage. Higher values increase the possibility of a frozen frame. Freeze Duration Sets the amount of time for a Freeze Frame. Default setting is 0.3. Value range is 0 to 5, measured in seconds. Higher values increase the length of the freeze. Duration Variation (%) Determines how much a block of Freeze Frame time can vary in length. Default setting is 25%. Value range is 0 to 100, measured in percentage. Higher values increase the variation in length. TV Roll creates a scroll of your source footage. This was designed to simulate the rolling frames of a TV screen with bad reception. It is especially suited if you are using Holomatrix for a bad TV effect. TV Distortion warps your source footage into a wavy analog signal distortion pattern. TV Distortion can only happen when the TV Roll effect becomes active. There are settings for amount, speed and duration of the TV roll. Once a bunch of TV frames roll by, there is a gap in time before the next TV Roll happens. TV Roll Speed determines how fast the image rolls up or down. Default setting is 10. Value range is -20 to 20. Higher values give the roll a faster speed. % Chance of TV Roll Determines how likely a given block of time will have a TV Roll. Default setting is 10. Value range is 0 to 100 and measured in percentage. Higher values increase the likeliness of the roll. TV Roll Duration Duration determines the length of time for a TV Roll. Default setting is 0.3. Value range is 0 to 5. Higher values increase the amount of time that a frame roll lasts. TV Roll Duration Variation (%) Determines how much a block of TV Roll time can vary in length. Default setting is 25%. Value range is 0 to 100. Higher values increase the length of time variation. % Chance of TV Distortion: Determines how likely it is that a given TV Roll will have a TV Distortion. Default setting is 10. Value range is 0 to 100 and measured in percentages. Higher values increase the likeliness of the distortion. TV Roll Distort Amount: Determines the strength of the distortion effect. The higher the number, the more distorted the footage will be. TV Distortion Scale: Determines how big the pattern of distortion will be. A low number means the analog waves of distortion will be compressed closer together vertically. A higher value pushes the distortion waves further apart. TV Distortion Random Seed: Randomizes the distortion pattern and likelihood of occuring, based on the random seed value. Flickering creates a random flickering of the image opacity. Great for TV Distortions or signal loss. Flicker Opacity Min determines how low the opacity of the flicker in the effect will drop to. Value range is 0 to 100. Higher values mean the frame will not completely disappear when flicker occurs. % Chance of Flicker Determines how likely a given block of time will have flicker. Default setting is 10. Value range is 0 to 100 and measured in percentage. Higher values increase the likeliness of the roll. Flicker Duration Duration determines the length of time for flicker. Default setting is 0.5. Value range is 0 to 5. Higher values increase the amount of time that a frame flicker lasts. Flicker Duration Variation Determines how much a block of flicker time can vary in length. Default setting is 25%. Value range is 0 to 100. Higher values increase the length of time variation. The Strobe effect creates a strobing of a layer’s opacity between 2 values. It is especially useful in creating the effect of a projected hologram’s refresh rate not matching with a camera’s shutter speed. Strobe - Opacity Min: Sets the minimum opacity for the layer during strobe. Higher values give a greater opacity to the layer. Lower values make trthe layer more transparent. Strobe - Opacity Max: Sets the maximum opacity for the layer during strobe. Higher values give a greater opacity to the layer. Lower values make the layer more transparent. Opacity Min and Max work together. Min sets how transparent the lines can be, while Max sets how opaque (or solid) they can appear. Strobe Every X Frames sets how often the layer strobes. A value of 1 makes it strobe at every frame. A value of 2 at every other frame. Higher values make the strobe happen less frequently. Fade Instead of Strobe determines if the layer fades or strobes between Min and Max opacity values. When the checkbox is off, the layer strobes. This means it’s opacity jumps between the Min and Max values over time, determined by the control Strobe Every X Frames. When this checkbox is on, the lines do a 'fade'. This means they interpolate between values, becoming more or less visible over time. The longer your strobe time, the more you will see the difference between a strobe and a fade. If your strobe time is only a few frames, the fade up and down will happen quite quickly, almost looking like a strobe light effect, especially if you are using a low frame rate. Glitching determines how often and how much the image gets a digital glitch - blocky pieces of the image displaced. Glitch holes determines if a given glitch has blocky patches of the image removed. % Chance of Glitch Determines how likely a given block of time will have Glitch. Default setting is 10. Value range is 0 to 100 and measured in percentage. Higher values increase the likeliness of the roll. Glitch Amount This control allows you to increase or decrease the amount of pixels in the frame effected by Glitch. Value range is 0 to 100 and measured in percentage. Higher values increase the occurrence of the glitching. Glitch Size Determines how large the blocks of glitch are relative to the frame. Default setting is 10. Value range is 0 to 200. Higher values produce larger blocks. Glitch Aspect Stretch or squeeze the Glitch blocks to correspond them to the aspect ratio of the frame. Default setting is 4. Value range is 0 to 40. Higher values produce larger blocks. Glitch Complexity The slider will bring smaller, more random pixels into the Glitch blocks when increased. Default setting is 2. Value range is 1 to 5. Higher values produce more complex areas of glitch with smaller random pixel distortion. Glitch Fragments When increased, this slider breaks up the Glitch blocks more frequently into quartered areas that appear and disappear at random. Default setting is 33. Value range is 0.0 to 200.0. Glitch Displacement H The first Displacement slider offsets the glitch effect from its original position along the X Axis. Default setting is 0.5. Value range is -2.0 to 2.0. Glitch Displacement V The second Displacement slider offsets the glitch effect from its original position along the Y Axis. Default setting is 0.5. Value range is -2.0 to 2.0. Glitch Speed Controls how quickly the Glitch effect moves and changes within the timeline - basically a “glitches per second” setting. Default setting is 6.0. Value range is 0 to 120. Glitch Random Seed Randomly changes the appearance of the glitching. Value range is 0 to 1000. Changing the value selects a different random seed. Glitch Duration Duration determines the length of time for Glitch. Default setting is 0.5 (half a second). Value range is 0 to 5. Higher values increase the amount of time that a frame Glitch lasts. Glitch Duration Variation Determines how much a block of Glitch time can vary in length. Default setting is 25%. Value range is 0 to 100. Higher values increase the length of time variation. % Chance of Glitch Holes Determines how likely a given block of time will have a Glitch hole. Default setting is 10. Value range is 0 to 100 and measured in percentage. Higher values increase the likeliness of the roll. Glitch Hole Size Determines how large the blocks of glitch hole are relative to the frame. Default setting is 160. Value range is 0 to 200. Higher values produce larger blocks. Glitch Hole Aspect Stretch or squeeze the Glitch hole blocks to correspond them to the aspect ratio of the frame. Default setting is 4. Value range is 0 to 40. Higher values produce larger blocks. Glitch Hole Complexity The slider will bring smaller, more random pixels into the Glitch hole blocks when increased. Default setting is 2. Value range is 1 to 5. Higher values produce more complex areas of glitch with smaller random pixel distortion. Glitch Hole Fragments When increased, this slider breaks up the Glitch hole blocks more frequently into quartered areas that appear and disappear at random. Default setting is 80. Value range is 0.0 to 200.0. Traveling Distortion creates the effect of a horizontal pattern of distortion scrolling down the screen. With the right settings it can also be used to generate a randomly placed line of distortion that jumps around the footage. TD - % Chance: Determines how likely a given block of time will have a traveling distortion. TD - Duration: Determines the length of time for a Traveling Distortion. TD - Duration Variation: Determines how much a block of Traveling Distortion time can vary in length. Higher amounts mean more variation from the set duration. TD - Line Speed: Determines how fast the line will scroll down the screen. Negative numbers make the distortion pattern travel up the screen, instead of down. TD - Distortion Speed: Determines how fast the pattern of distortion evolves. TD - Distortion Strength X: Determines how much the footage will be distorted horizontally. Higher values = more distortion. TD - Distortion Strength Y: Determines how much the footage will be distorted vertically. Higher values = more distortion. TD - Soften Distortion Map blurs the distortion map to create a smoother, less-jagged distortion. TD - Distortion Scale: Determines the size of the distortion pattern. TD - Distortion Falloff: Determines how much the distortion fades vertically before there is no more distortion. With a low value, the distortion will just cut off. With a high value, the distortion will fade off more organically. TD - Chromatic Distortion: Activates Chromatic distortion, displacing pixels on the Red, Green, and Blue Channels differently for a more organic effect. TD - Displace Red X: Controls the amount of horizontal displacement on the Red channel. Higher values create more displacement. TD - Displace Red Y: Controls the amount of vertical displacement on the Red channel. Higher values create more displacement. TD - Displace Green X: Controls the amount of horizontal displacement on the Green channel. Higher values create more displacement. TD - Displace Green Y: Controls the amount of vertical displacement on the Green channel. Higher values create more displacement. TD - Displace Blue X: Controls the amount of horizontal displacement on the Green channel. Higher values create more displacement. TD - Displace Blue Y: Controls the amount of vertical displacement on the Green channel. Higher values create more displacement. TD - Distortion Blur Amount: Controls the amount of blurring in the distorted areas of the footage. Higher values create more blurriness. TD - Distortion Blur Quality: Controls the Quality of the distortion blur. Higher values yield smoother results, but may slow down image processing. TD - Distortion Blur Falloff: Creates a falloff of blur from the distortion area’s center outward. With no falloff, the blur cuts off where the distortion ends. With falloff, the blue ramps down visually from the distortion center outward. TD - Fade Time: Determines how much time will be used to fade the distortion on and off at the beginning and end of the effect occurrence, or as it reaches the top or bottom edge. With a low number, the distortion will appear to pop onto the screen. With a higher number, it will fade in smoothly over time. TD - Offscreen Edge %: Determines how far from the edge the fade begins. TD - Random Start Position: Allows the scrolling effect to start from a random position so that the effect seems more organic - rather than it starting from the very top each time, and looking repetitive. TD - Randomize Position: When turned on, the distortion line will jump position horizontally, while continuing to scroll up or down. How often it jump position is based on the next parameter: TD - Randomize Position Frequency. TD - Randomize Position Frequency: This determines how often the distortion line will jump horizontally each second. A value of 30, means that it will jump position 30 times a second. TD - Random Seed: Randomized the various properties in the Traveling Distortion effect. 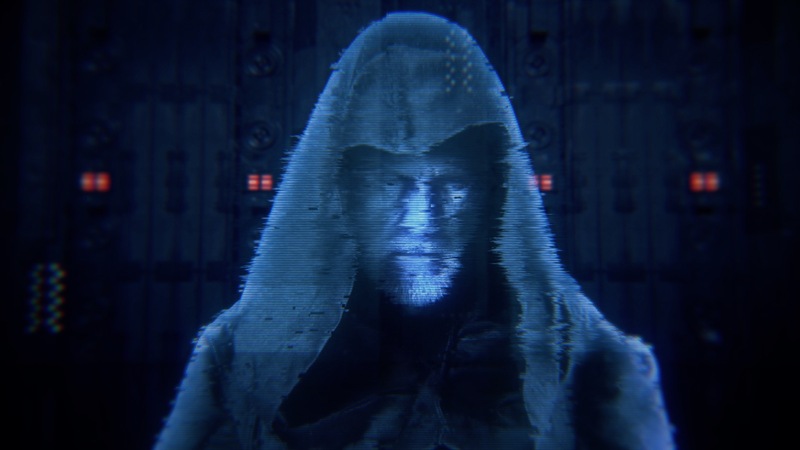 If Distort Last is turned on, then the scanlines will be distorted along with the rest of the footage - simulating damaged holographic equipment. If Distort last is turned off, then the scanlines will remain clean, simulating a bad signal. Block Distortion creates the effect of a blocky bits of distortion on your footage. BD - % Chance: Determines how likely a given block of time will have a block distortion. BD - Duration: Determines the length of time for a Block Distortion. BD - Duration Variation: Determines how much a block of Block Distortion time can vary in length. Higher amounts mean more variation from the set duration. BD - Block Speed: Determines how fast the line will scroll down the screen. Negative numbers make the distortion pattern travel up the screen, instead of down. BD - Block Amount: Determines the number of distortion blocks that will be generated on screen. BD - Block Size: Determines the size of the distortion blocks. BD - Block Aspect: Determines the aspect ratio for the distortion blocks. Higher numbers create wider blocks. BD - Distortion Speed: Determines how fast the pattern of distortion evolves. BD - Distortion Strength X: Determines how much the footage will be distorted horizontally. Higher values = more distortion. BD - Distortion Strength Y: Determines how much the footage will be distorted vertically. Higher values = more distortion. BD - Soften Distortion Map: Blurs the distortion map to create a smoother, less-jagged distortion. BD - Distortion Scale: Determines the size of the distortion pattern. BD - Distortion Falloff: Determines how how much the distortion fades around the edges before there is no more distortion. With a low value, the distortion will just cut off at the edges, going from distorted to non-distorted, abruptly. With a high value, the distortion will fade off more organically. BD - Chromatic Distortion: Activates Chromatic distortion, displacing pixels on the Red, Green, and Blue Channels differently for a more organic effect. BD - Displace Red X: Controls the amount of horizontal displacement on the Red channel. Higher values create more displacement. BD - Displace Red Y: Controls the amount of vertical displacement on the Red channel. Higher values create more displacement. BD - Displace Green X: Controls the amount of horizontal displacement on the Green channel. Higher values create more displacement. BD - Displace Green Y: Controls the amount of vertical displacement on the Green channel. Higher values create more displacement. BD - Displace Blue X: Controls the amount of horizontal displacement on the Green channel. Higher values create more displacement. BD - Displace Blue Y: Controls the amount of vertical displacement on the Green channel. Higher values create more displacement. BD - Distortion Blur Amount: Controls the amount of blurring in the distorted areas of the footage. Higher values create more blurriness. BD - Distortion Blur Quality: Controls the Quality of the distortion blur. Higher values yield smoother results, but may slow down image processing. BD - Distortion Blur Falloff: Creates a falloff of blur from the distortion area’s center outward. With no falloff, the blur cuts off where the distortion ends. With falloff, the blue ramps down visually from the distortion center outward. BD - Random Seed: Randomized the various properties in the Block Distortion effect. BD - Distort Last: If Distort Last is turned on, then the scanlines will be distorted along with the rest of the footage - simulating damaged holographic equipment. If Distort last is turned off, then the scanlines will remain clean, simulating a bad signal. SD - % Chance: Determines how likely a given block of time will have a screen distortion. SD - Duration: Determines the length of time for a screen distortion. SD - Duration Variation: Determines how much a block of Screen Distortion time can vary in length. Higher amounts mean more variation from the set duration. SD - Distortion Speed: Determines how fast the pattern of distortion evolves. SD - Distortion Strength X: Determines how much the footage will be distorted horizontally. Higher values = more distortion. SD - Distortion Strength Y: Determines how much the footage will be distorted vertically. Higher values = more distortion. SD - Soften Distortion Map: Blurs the distortion map to create a smoother, less-jagged distortion. SD - Distortion Scale: Determines the size of the distortion pattern. SD - Chromatic Distortion: Activates Chromatic distortion, displacing pixels on the Red, Green, and Blue Channels differently for a more organic effect. SD - Displace Red X: Controls the amount of horizontal displacement on the Red channel. Higher values create more displacement. SD - Displace Red Y: Controls the amount of vertical displacement on the Red channel. Higher values create more displacement. SD - Displace Green X: Controls the amount of horizontal displacement on the Green channel. Higher values create more displacement. SD - Distortion Blur Amount: Controls the amount of blurring in the distorted areas of the footage. Higher values create more blurriness. SD - Distortion Blur Quality: Controls the Quality of the distortion blur. Higher values yield smoother results, but may slow down image processing. SD - Random Seed: Randomized the various properties in the Block Distortion effect. SD - Distort Last: If Distort Last is turned on, then the scanlines will be distorted along with the rest of the footage - simulating damaged holographic equipment. If Distort last is turned off, then the scanlines will remain clean, simulating a bad signal.